Enjoy the sounds of B. A. Rolfe and his Orchestra as he brings you popular tunes and talented singers from the 1930s. B.A. 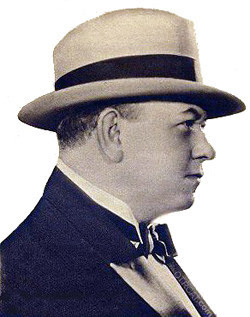 Rolfe was an actor, musician, bandleader, vaudevillian, and film producer in the early part of the twentieth century. 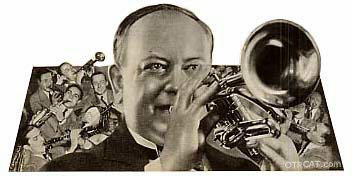 Known as "The Boy Trumpet Wonder" while touring with his father as a teenager, he inspired Louis Armstrong to work to reach those difficult high notes on the trumpet. In addition to the cornet, Rolfe also played the piccolo. In 1914, Rolfe began producing silent films but by 1918, he was having financial difficulties even though he produced over 100 films. After Rolfe Photoplays folded, he worked as a producer and director for several film companies. In 1920, he went back to music appearing as a soloist, instructor and a producer of vaudeville shows. After working with several orchestras, Rolfe formed his own dance orchestra. Their performances from the Palais D'Or restaurant and nightclub were broadcast live over the radio. His four week contract turned into a four year run. He continued his radio broadcasting career on the Lucky Strike Dance Hour as both bandleader and announcer. After the Lucky Strike Dance Hour ended, Rolfe and his orchestra continued broadcasting until the late 1930s with different sponsors including Ivory Soap, Hudson Autrepomobiles and, finally, Ripley's Believe It or Not. By the early 1940s, Rolfe's radio career was beginning to wind down. In 1942, he organized an all-female orchestra and toured the country playing patriotic songs. Rolfe died in 1956 in Walpole, MA. Other musical program include: Artie Shaw, Benny Goodman, Glenn Miller, Harry James Show, Johnny Mercer Collection, and Kay Kyser (Kollege of Musical Knowledge). Be the first to comment on "B.A. Rolfe and His Orchestra"